I am a professor and chief of Pediatric Infectious Diseases, as well as the associate dean for Global Health and the director of Global Health Education at Wake Forest School of Medicine. 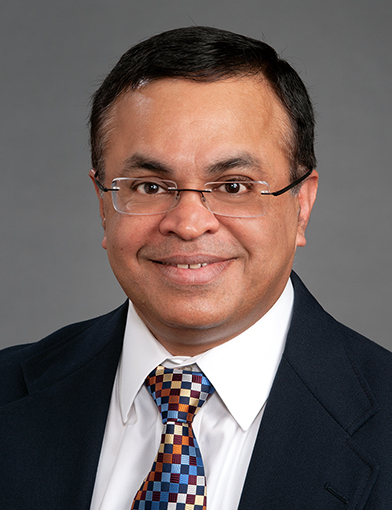 After earning my medical degree and completing a pediatric residency in Mumbai, India, I completed a pediatric residency and ambulatory/general academic pediatric fellowship at Louisiana State University School of Medicine, followed by fellowship training in Pediatric Infectious Disease at Stanford University School of Medicine. I joined the faculty at Wake Forest School of Medicine in 2001. From 2001 to 2012, I led perinatal HIV prevention studies in Zimbabwe as the principal investigator at the School and as the on-site scientific director. These studies were funded by the National Institutes of Health and the USAID/Elizabeth Glaser Pediatric AIDS Foundation. I also served as co-PI on a Fogarty NIH-funded project aimed at capacity building of biomedical scientists in India. I am an elected Fellow of the Pediatric Infectious Disease Society and the Infectious Disease Society of America, a member of the American Pediatric Society and Society for Pediatric Research, and the school representative at the Consortium of Universities in Global Health. My interests include HIV prevention, human papillomavirus vaccine implementation, antimicrobial resistance and tropical infections. Knowledge, attitudes and factors associated with acceptability of human papillomavirus vaccination among undergraduate medical, dental and nursing students in South India. Shetty S, Prabhu S, Shetty V, Shetty AK. Hum Vaccin Immunother. 2019 Jan; :1-10. Correlates of Late Presentation to HIV care in a South Indian Cohort. Rao S, Av S, Unnikrishnan B, Madi D, Shetty AK. Am. J. Trop. Med. Hyg. 2018 Nov; 99(5):1331-1335. Sudden Cardiac Arrest Due to Hemophagocytic Lymphohistiocytosis in a Child. McCrory MC, Wang SS, Shetty AK, McLean TW, Lantz PE, Cannon ML. J Emerg Med. 2018 Nov; 55(5):e119-e123. Detection of Human Papilloma Virus and Risk Factors among Patients with Head and Neck Squamous Cell Carcinoma Attending a Tertiary Referral Centre in South India. Bandhary SK, Shetty V, Saldanha M, Gatti P, Devegowda D, R PS, Shetty AK. Asian Pac. J. Cancer Prev. 2018 May; 19(5):1325-1330. Prevalence and Characteristics of Pruritus and Association With Quality of Life in People Living With HIV: A Cross-Sectional Study. Xu T, Shetty AK, Badiger S, Chan YH, Yosipovitch G. J Pain Symptom Manage. 2018 05; 55(5):e4-e7.